This story was updated at 11:53 on November 21, 2017. Competition for spaces in Winooski's downtown municipal parking garage landed in court Monday. 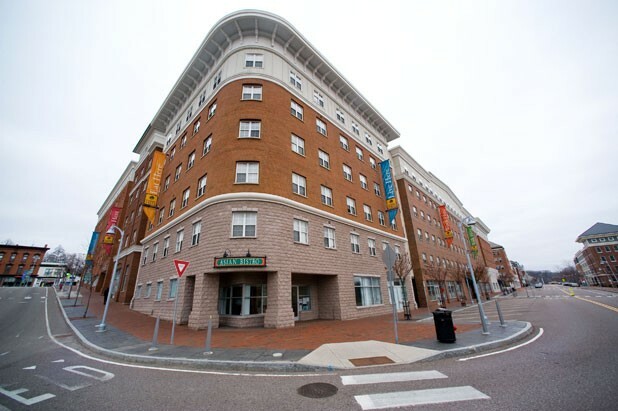 Lenders connected to Spinner Place, a 312-unit student apartment complex, filed suit against the City of Winooski in U.S. District Court, claiming that the city unfairly terminated a garage lease for building residents last January. The city "illegally took parking dedicated to, and needed by, downtown residents and gave the parking as an incentive to other developers," said a statement issued Monday by Montpelier lawyer Ronald Shems, who represents the Spinner Place lenders. The loss of parking "severely limited" the ability to fully rent the units and created additional costs, the statement continued. The city has "oversubscribed" the 916-space garage with lease agreements for 923 spaces and now refuses to consider a long-term lease with Spinner Place, the suit says. It seeks an injunction requiring the city to enter into a long-term parking lease with Spinner Place and pay damages and legal costs. The lawsuit was filed by UMB Bank of Kansas City, Mo. It is the trustee for bondholders who helped finance the construction of Spinner Place in 2004 through the Vermont Housing Finance Agency. In a statement issued Tuesday morning, Winooski City Manager Jessie Baker said municipal officials are working on creative solutions to meet the long-term parking needs of Spinner Place residents and others. "People want to live and work in Winooski," Baker's statement reads. "This is a good problem to have. We look forward to continued conversations in partnership with all the downtown property owners to ensure that parking needs are met." It also suggested that the lawsuit was not the right approach. "We are disappointed that the UMB Trustee has opted to sue the city instead of continuing discussions about long-term parking solutions," Baker stated. "We are hopeful that the parties can come to agreed upon terms and avoid lawsuits that ultimately cost the taxpayers." Earlier this year, Baker defended the city's management of the garage and said a study was under way to respond to concerns about parking for Spinner Place and downtown employers including MyWebGrocer. Competition for slots in the city garage has intensified with the successful $200 million-plus redevelopment of downtown Winooski over the past dozen years. Some have started calling the old mill city the Brooklyn of Burlington. But this Brooklyn lacks a subway system to help people travel car-free. Parking woes are by now familiar. 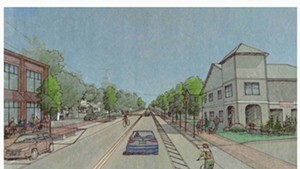 Both a proposed hotel and a proposed live music venue in Winooski, the Strand, have triggered opposition from some residents and business owners who are worried that new development will aggravate the parking crunch. The lawsuit says the City of Winooski first entered into a parking agreement with Spinner Place in 2004 for 230 spaces. The agreement was amended and extended at least three times, the suit says. Then on October 3, 2016, the city issued a letter to the property manager of Spinner Place, Hallkeen Management, stating that effective January 1, 2017 it "will no longer be leasing spaces in the garage to customers without a long-term contract, including Spinner Place residents." The letter further stated that "public metered spaces are available for use by any garage customer displaced by this change," according to the lawsuit. The suit says that the metered rate is "more than four times greater than typical monthly residential parking rates for downtown parking, and grossly out of proportion with fair market student parking rates." In the meantime, the suit says, the city has leased spaces in the garage to other entities including a "yet-to-be developed concert and performing arts venue," an apparent reference to the Strand project. The city agreement with the nightclub developers would provide up to 550 spaces in the parking garage for evening and weekend events — "the same time that Spinner Place residents are typically at home and need parking," the lawsuit states.